Attleboro went into 2017 with an inexperienced lineup and first-year head coach Kevin Patton tried to bring together a roster that had essentially never played together at the varsity level. With all but two players back for this spring, Patton is expecting the Bombardiers to be improved in all facets of the game and to be more competitive in the league. Leading scorer Kyra Lyons is back for her third varsity season and the junior midfielder will be a key player, as the Bombardiers look to improve on last season’s league-low 88 goals. The offense will be bolstered by senior Emily Patton, who is a four-year varsity player, and fellow senior Alison Wall. Junior Alex Compton will also be back for a third season to make an impact for Attleboro. On defense, seniors Graycen Cassidy and Kim White will provide much-needed leadership for a unit that allowed 273 goals last year. Canton has a new coaching staff this season that will try to build on a talented crop of underclassmen to get the Bulldogs back into the postseason. Laurie Chabot has taken over this spring and the coaching staff is excited to get the season underway and see what this Bulldogs roster, which has only three seniors, can accomplish. Senior midfielder Molly Colburn will be the leader for the Canton attack this season, while fellow captain Colleen Boucher provides vocal leadership in the defensive zone to keep everything in check. Senior Jess Powers is still battling an injury, but Canton has a host of younger players that can step in, including juniors Maggie Connolly, Lauren Fitzpatrick, Maggie Malloy, and Leah McLellan and sophomore Alexa Maffeo, who all had success with their winter teams. Last season, Foxboro reached the Div. 2 East final for the first time in program history, continuing the program’s upward trend as one of the top D2 teams in the state. The loss to Walpole in the final has left the Warriors, who had only four seniors on last year’s roster and return 10 starters, wanting more and the team comes into a new season experienced, battle-tested, and loaded with talent, including 2017 league MVP Sophia DiCenso, who in her two varsity seasons has already made quite an impression with her all-around game. Joining DiCenso in the potent Foxboro attack is fellow junior Meghan Curran, who is coming off a breakout season and is capable of finishing against the best defenses. 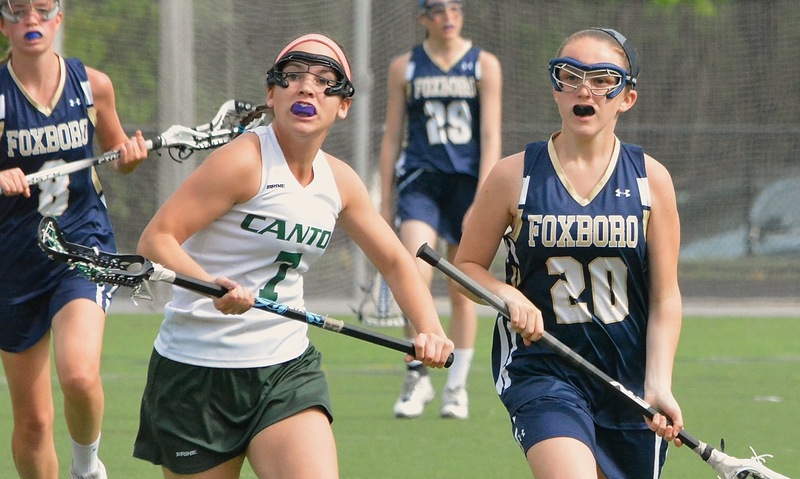 Senior Caroline Boudreau returns as one of Foxboro’s biggest threats on the draw and classmate Christina Rogers is back to lead the defensive unit, which is an aggressive group that puts a lot of pressure on the opposition. Sophomore Sara Addeche is back in goal after a very strong rookie season. 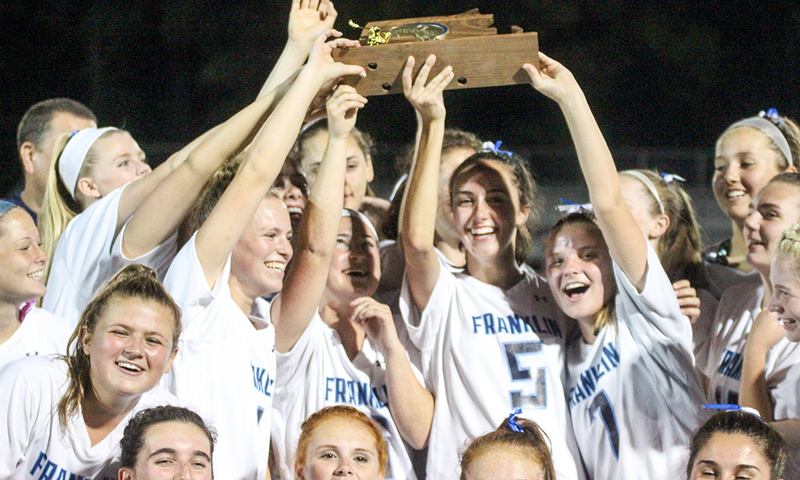 Franklin has emerged not only as the top program in the Hockomock League but in recent seasons as one of the top programs in the state. The Panthers have won the Div. 1 East title in three of the past four seasons, although they have yet to find a way past the state semifinal and get the opportunity to play for a state championship. Despite being a team loaded with underclassmen again this spring, Franklin comes into the new season once again as the team to beat in the league and with state title aspirations. It was an up-and-down spring for King Philip in 2017, but it certainly finished on a high as the Warriors pulled off a pair of upsets in the state tournament to reach the Div. 1 East semifinal and a rematch with rival Franklin. The Warriors will have a new coach, Kourtnie Wilder takes over this season, and a number of returning players to make a run at unseating the Panthers from the top of the Kelley-Rex division, including senior attacker Katie Crowther, who comes into the season with more than 200 goals for her career. One of the strengths for KP this season will be the defense, which is loaded with experience and vocal leaders. Christina Hathaway and Victoria Tormey will be the key defensive returners along with Caroline Watson, who has been one of the league’s top goalies for the past two seasons. The midfield will chip in on defense and help Crowther in the attack. Dana Truini, Alli Meehan, and Caroline Klim will all be back to solidify the midfield unit. Mansfield got back into the tournament last season and gave Bishop Feehan all it could handle in the first round. The Hornets come into this spring motivated by unfinished business, as they look to not only get back to the postseason but also to make a deep tournament run. The first week of the season will provide a good early test with Mansfield facing Natick, Sharon, and North Attleboro, all 2017 playoff teams, right out of the gates. The Hornets return four seniors from last year’s team and they will be expected to provide the leadership to push a talented group of juniors. Ann Maher will be back to add steel to the midfield and will try to get the ball forward to senior attacker Lauren Whitman and junior Katie Garvin. The defense will be as strong as its ever been, according to head coach Alexis Kobey, anchored by senior Danielle Skinner and with senior Hannah Sternberg back in goal. In his second year in charge, Milford head coach Tim Dowd said that his team is focused on trying to outwork teams this season and to be “scrappy on the field,” as the Hawks look to make a move up the standings and compete with what has developed into a very deep league. The Hawks return several key players and have a few freshmen that will be added to the mix and given the opportunity to contribute right away. Junior Emily Haley is the leader of the attack and Dowd said that he is expecting her to “have an incredible season.” Joining Haley in the midfield and attack are senior Jadyn White, junior Brianna Maietta, and sophomore Annie Flanagan. The defense has several players back from last season, including seniors Emily Condon and Alexa Lancisi, who provide the necessary vocal leadership to keep the defensive unit organized. Dowd added that there are a number of underclassmen that will play important roles this season, as the Hawks use their team speed to cause problems. North Attleboro has achieved quite a bit in the past few seasons, including its first home playoff game and its first playoff victories, and new coach Colleen Carchedi, who comes over from Sharon after achieving similar success in building that program up, is hoping to continue the Rocketeers’ upward trajectory. North will have a tough non-league schedule to prepare itself to make a deep tournament run. One of the key players that North will rely on this season is senior midfielder Mackenzie Rosenberg, who was in the league MVP conversation last season and has been one of the league’s top scorers for the past two seasons. Senior Alaina Mello and senior goalie Kayla Moulin will lead the defensive effort along with classmate Caroline Vigorito. North will have plenty of speed to call on in the midfield this season with senior Julia Tolfa and sophomores Katie Lindstrom and Lindsey Spratt. The attack will be led by seniors Camille Pizarro and Julia Dakin, who are part of a very experienced roster that wants to lift North beyond the second round for the first time. Oliver Ames is another developing program that has added depth to the Hockomock League in recent seasons and the Tigers are poised to make a breakthrough into the postseason as first-year coach Nicole Lang takes over this spring. While the coach is one of several new faces for the Tigers this season, Lang believes that OA will be able to build on its successes from the past few years to continue building the program. Senior goalie Ariana Waldorf, fresh off a trip to Israel this winter to help spread the game of lacrosse, will be back between the pipes this spring for the Tigers, one of many talented goalies across the league. Chloe Kilkelly and Olivia Piazza, who was named to the HockomockSports.com Second Team last year, will provide leadership and be counted on to step up in all phases this year. Sharon has been a program on the rise for the past several seasons, including best-ever second-place finishes in the Davenport division, the program’s first playoff appearance, and last spring the Eagles added a first playoff win as well. While Sharon will move on this year with a new coach and without leading scorer Alex Rabb, the Eagles still have the talent to make a run at the postseason and new coach Shara Ginthwain has been an assistant at Sharon for the last three years, so it should be a smooth transition for the players. Senior Sabrina Robbins is back to add dynamism to the midfield in both defense and attack and she will be joined by junior Emma Eberhardt, who adds speed, size and finishing ability from the middle of the field. Senior Abbi Solomon is back in the attack and junior Bridget McManus will be back in the heart of the defense. With 10 returning players, experience will be a strength for the Eagles, particularly on the defensive side where goalie Rose Wald also returns. Freshman midfielder Jenna Goldstein is a newcomer to watch for Sharon this year. Taunton is still a relatively young program and it enjoyed its best season in 2017 with seven wins, including a pair of wins in the league, and now the Tigers are going to try to build on that despite the loss of several players that had significant impacts. The focal point for Taunton this spring will be freshman midfielder Alana Tavares, who put together a stellar rookie campaign as an eighth grader and was one of the league’s leading scorers. While much of the attention will, deservedly, be on Tavares and the attack, senior goalie Lorna Li is also back to give the defense some solidity after a really strong junior season. Seniors Hannah Moniz, Diana Brens, and Kayla Phillips will also be back to try and chip in with goals and leadership, while sophomore Kamryn Li could take on a larger role after the graduations of Abbey Kingman and Delaney Powell. Freshmen Anastasia Lajoie and Rosemary McGrath also saw time with Tavares as eighth graders last year and could step in to contribute more this season. There is a new coaching staff for the Canton girls’ lacrosse this season and first-year head coach Chrissy O’Connor is looking forward to surprising a few people with a strong spring. Seniors Casey Bradley (attack) and Olivia Devoe (midfield) will be the team leaders and the keys to the Bulldogs making a charge at Foxboro for the league title. Sophomore midfielder Molly Colburn and freshman Leah McClellan will be newcomers to watch this year as well. At the end of last year’s Div. 2 East semifinal, Foxboro coach Brittany Sherry was emotional about losing the crop of seniors that had joined the program the same year she began. That group had won four straight league titles and gone further than any other team in program history. But when Sherry was asked about the future, she was confident in the talent coming back and believed that her fifth season could be another title-winning spring. Senior Melissa Lynch was a standout in goal last year and will be back between the pipes and will have a strong defensive core in front of her including junior Hallie Canfield and senior Annie McGeary. Offensively, Foxboro will be looking for continued development from junior Lauren Flahive and sophomore Catherine Luciano, who will both be asked to fill in for senior Chloe Hurley, who begins the season with an injury. Young players helped Foxboro on its run to the semifinal and freshman Sophia Dicenso is the next in line to try and make an instant impact for the Warriors. Juniors Ally Curran and Molly Farrell could also be poised for breakout seasons. All eyes are on the matchup with Franklin in May, as the two teams have won their respective divisions each of the past four years, but Foxboro also has Hingham, Medfield, and Walpole on its schedule as it sets its sights on another tournament run. Milford comes into the new season with a young roster after losing eight seniors from last year’s squad and head coach Jason Gelmini is hoping that the many underclassmen who saw playing time in 2015 will be ready to step into bigger roles in 2016. The Hawks will be led by senior midfielders Morgan Smith and Julie Dam and senior defender Erin Fleming and Gelmini is counting on his captains to provide leadership. In addition, the Hawks will lean on junior defender Brainna Croteau, junior goalie Hannah Cairney, junior middie Jillian Burley, and junior attackers Taylor Dube and Jordyn Lombardo. Oliver Ames is coming off a strong season in which the Tigers reached the Div. 1 East sectional before falling to Bishop Feehan in the opening round. This year, OA has a lot of returning players who experienced what a playoff run was like and head coach Craig Gardner is counting on that experience to pay dividends this spring. The Tiger will be led by a strong senior class, including midfielder Erin Fitzgerald and defenders Cassie Gavin and Sarah Lewis. Senior attackers Abby Duvall and Sam Lang will help Fitzgerald provide attacking power while senior midfielder Carly Cidado and junior defender Katie Davenport will help lock things down at the back. Gardner also noted a few young players that could be impact players this season, including sophomores Sofia Masciarelli, Chloe Kilkelly, and Ariana Waldorf and junior Kendall Clifford. Freshman defender Olivia Piazza will also be a newcomer to watch this season. Sharon had a program best record of 7-10 last season under first-year coach Colleen Manning, who is expecting the Eagles to take an even bigger leap this year by making the postseason for the first time. Sharon only has three seniors (Alex Miller, Alexa Levitt, and Heather Seggelin), but plenty of young talent including “top shooter” Alex Rabb, attacker Anna Crosby, and defender Samantha Rabb (all juniors). Sophomore Sabrina Robbins is drawing attention from colleges and will be a force for the Eagles on draw controls, while freshman Lydia Chase will add a new face to the Sharon defense.